Nightly rate INCLUDES a last minute special for dates within 2 weeks, excluding holidays. GLORY DAYS has all the amenities you'll need for a wonderful stay. This cozy cabin is tucked away in a private setting, yet is only 3 miles from downtown Pigeon Forge off of Wears Valley Road. Tastefully decorated in a rustic theme and all wood interior for a true cabin feeling. The master bedroom offers a king size log bedroom set, 37' LCD TV with premium cable programming, fireplace, jacuzzi and foosball. Step outside the master bedroom deck to relax in the hot tub or rockers. The living room includes a queen sleeper sofa, TV/DVD, PS2 console and games and fireplace. Glory Days has all the amenities you desire including unlimited long distance and wireless high speed Internet access. The cabin is equipped with a keyless entry system, so you can arrive directly at the cabin with no need to pickup or drop off keys anywhere. Outdoor: Glory Days has 2 spacious decks to enjoy the peaceful mountain scenery and maybe have a glimpse of the deer, bears, turkeys and other animals from the nearby Smoky Mountain National Park. Enjoy the bubbly hot tub, and porch rockers. If you like to explore on foot, the park offers everything from short nature trails to longer back country hikes. The park is filled with trails, waterfalls and an abundance of wildlife. Horseback riding and trout fishing are also favorite outdoor activities in the Smokies. Location: Glory Days is tucked away in a private setting, yet is only 3 miles from downtown Pigeon Forge off of Wears Valley Road (Light #3) and minutes from Dollywood and Splash Country. 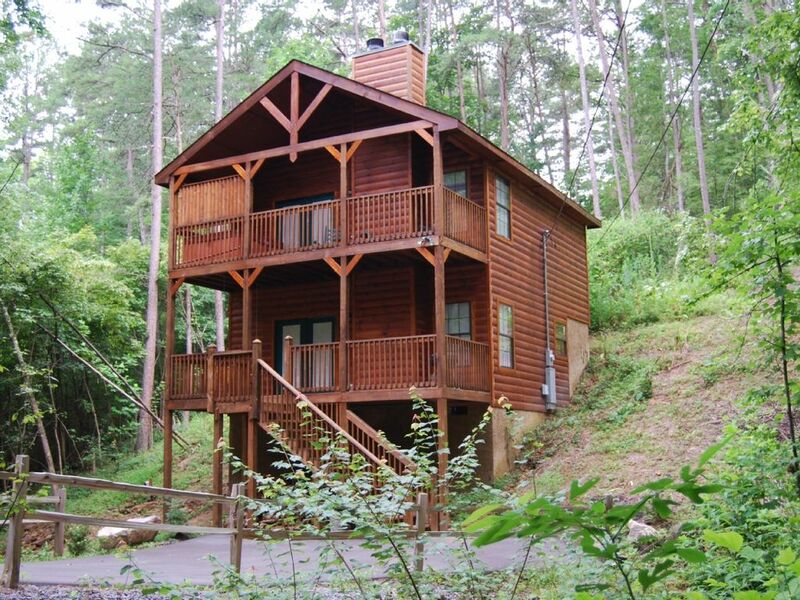 It is less than 10 minutes from downtown Gatlinburg and 45 minutes from Knoxville Tennessee. If you are looking for a place that gives the feeling of seclusion, but offers an abundance of activities, then this is the place. We fell in-love with the area the first time we visited and decided to get a vacation home. We enjoy spending time at the cabin with our 3 kids. The cabin is our home away from home and we make every effort to have the amenities to make our guests feel at home. The Aguiar family. We love the location of the cabin. The cabin is secluded, yet very close to everything. The main thing we enjoy at the cabin is the peace and quiet and spending time with our family. Great cabin, loved fireplace in bedroom. We had a fire each night. The owners had firewood at the cabin when we arrived. The porches are great. The cabin is secluded and romantic. Would definitely rent again. Very nice and easy to get too. Close in proximity to attractions. Lovely home, hot tub nice and decent water pressure. Only negative was that like every station on the cable we couldn't view. Would have been nice to have for the kids. Very nice cabin, but lots of steps. Very quiet area, but close to the strip. Everything you need to make a great vacation. Just wish there were more TV channels to choose from on rainy days. We had a wonderful weekend. First time in the mountains. Beautiful. First let me thank you for allowing us to stay in your cabin. Glory Days, a few miles from good food and places to shop. Hope on the next visit we will get to use hot tub. We had an awesome anniversary weekend. 'Glory Days' is located in a mountain setting approximately 3 miles from downtown Pigeon Forge (traffic light #3, Wears Valley Road), near the Smoky Mountain National Park, with miles of scenic vistas & hiking trails. Pigeon Forge offers numerous attractions, entertainment, dining and shopping. Pigeon Forge also offers horseback riding, biking, whitewater rafting, golf, go carting, & many other activities. 'Glory Days' is less than 10 miles from Gatlinburg & all it has to offer. Ski: Skiing is available in season in Ober Gatlinburg. Take the Aerial Tramway from downtown Gatlinburg to Ober Gatlinburg for ice skating all year long and skiing in winter when snow conditions are present. Ober Gatlinburg offers Go-Karts, Water Rides, Alpine Slide, Indoor Ice Skating, Black Bear Habitat, Chairlift, Shops, Restaurant/Lounge, Winter Skiing, Snowboarding and more! Thanksgiving, Christmas, New Years $145/night $870/week No check-out on 12/25 or 1/1. NO Pets Allowed. A deposit of $100 is required to reserve dates. Remainder of Payment is required 60 days prior to arrival.